DREM YOL LOK fellow Dovahkiin. When you play for a while, you begin to question things. Things such as "The Vampires are all bad." So here you'll see me going into a much darker character called Shadow. S/he is a fully integrated Vampire Lord who joined the vampires but stopped them later. Possible builds that I would suggest would be Khajiit, Dark Elves, and High Elves. 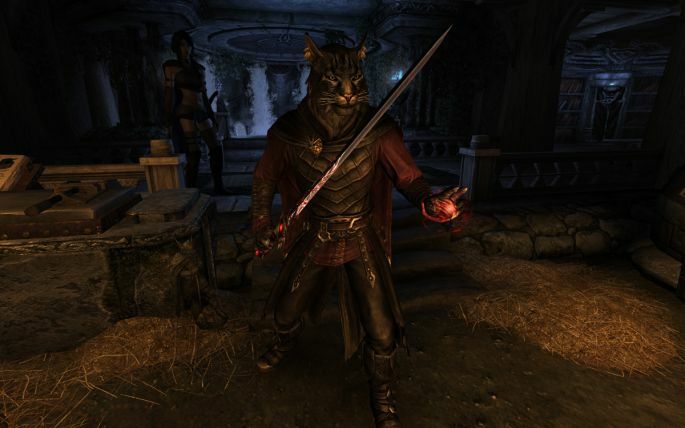 The reason for this is because Khajiits have natural nighttime powers, while all three of these races have a bonus to sneak, Dark elves have a boost to magic, and almost all elves have boosts to archery. Here you see a possible Shadow character build in a battle stance.